As I explained in the article “Security Device Manager aka SDM“, SDM is a Web-based device-management tool for Cisco routers that can improve the productivity of network managers, simplify router deployments, and help troubleshoot complex network and VPN connectivity issues. A virtual private network (VPN) is a computer network in which some of the links between nodes are carried by open connections or virtual circuits in some larger network (e.g., the Internet) instead of by physical wires. The link-layer protocols of the virtual network are said to be tunneled through the larger network when this is the case. 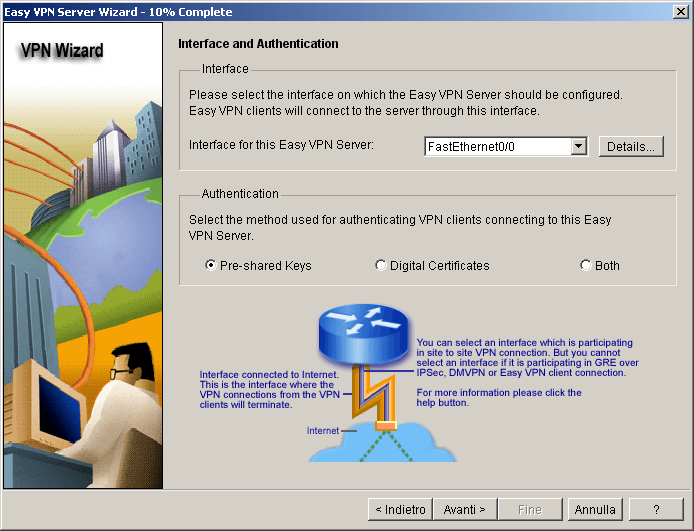 One common application is secure communications through the public Internet, but a VPN need not have explicit security features, such as authentication or content encryption. VPNs, for example, can be used to separate the traffic of different user communities over an underlying network with strong security features. Using this wizard, it is possible create a Layer3 VPN through IPSEC protocol. Internet Protocol Security (IPsec) is a suite of protocols for securing Internet Protocol (IP) communications by authenticating and encrypting each IP packet of a data stream. IPsec also includes protocols for establishing mutual authentication between agents at the beginning of the session and negotiation of cryptographic keys to be used during the session. IPsec can be used to protect data flows between a pair of hosts (e.g. computer users or servers), between a pair of security gateways (e.g. routers or firewalls), or between a security gateway and a host. IPsec is an end-to-end security solution and operates at the Internet Layer of the Internet Protocol Suite, comparable to Layer 3 in the OSI model. Other Internet security protocols in widespread use, such as SSL, TLS and SSH, operate in the upper layers of these models. This makes IPsec more flexible, as it can be used for protecting all the higher level protocols, because applications don’t need to be designed to use IPsec, whereas the use of TLS/SSL or other higher-layer protocols must be incorporated into the design of an application. Ok, and how can I create a VPN using SDM? If you have not configured AAA, the wizard asks you to configure it. Click on “Enable AAA” and click “OK” to close the popup. Click on next button (in this screenshot I will click on “avanti” tab… italian language hihihi), select the interface that will receive the VPN request from the VPN client (in my case fastethernet 0/0) and select the preshared keys authentication. Click on next button. 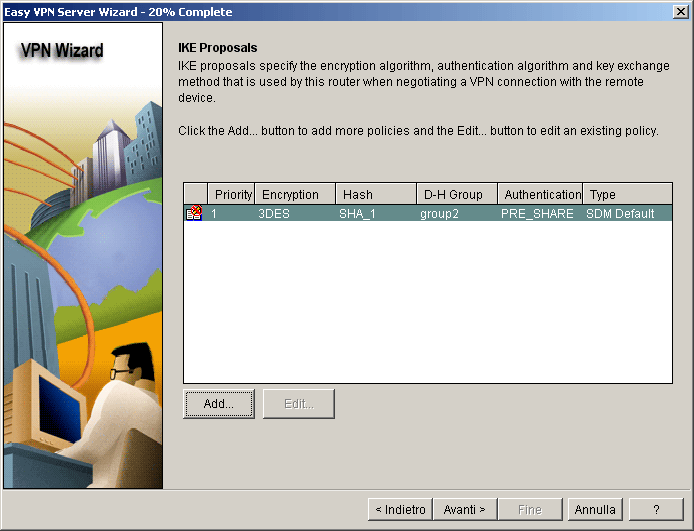 In this step you can configure the IKE proposals: IKE proposal priority, DH group (1, 2, or 5), Encryption algorithm (DES, 3DES, AES, or SEAL), HMAC (SHA-1 or MD5), IKE lifetime. If you prefer, you can change the default settings. Click on next button. 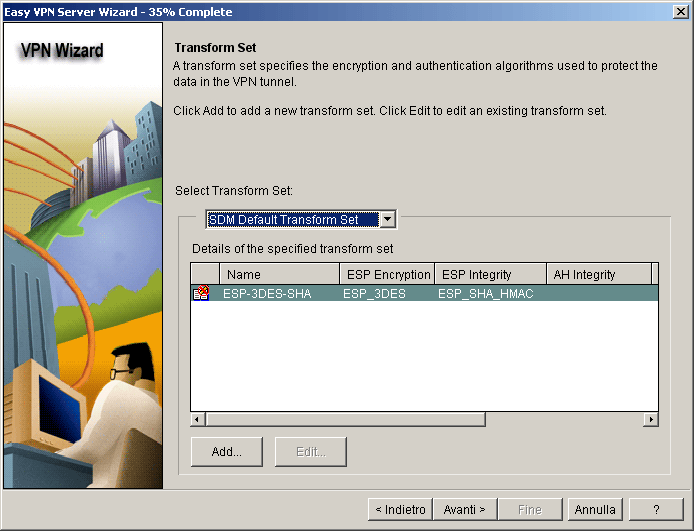 You can use the default or create a new IPsec transform set configuration using these parameters: Transform set name, Encryption algorithm (DES, 3DES, AES, or SEAL), HMAC (SHA-1 or MD5), Optional compression, Mode of operation (tunnel or transport). Click on next button. The local databse is recommended if you do not have RADIUS or TACACAS+ server in your network. Click on next button. Now define the group authorization and user group policies. When you click “Add…” button, you can define: General parameters, DNS/WINS, Split tunneling, Advanced options and Xauth Options. In our case it is sufficient configure the “General parameters” tab. 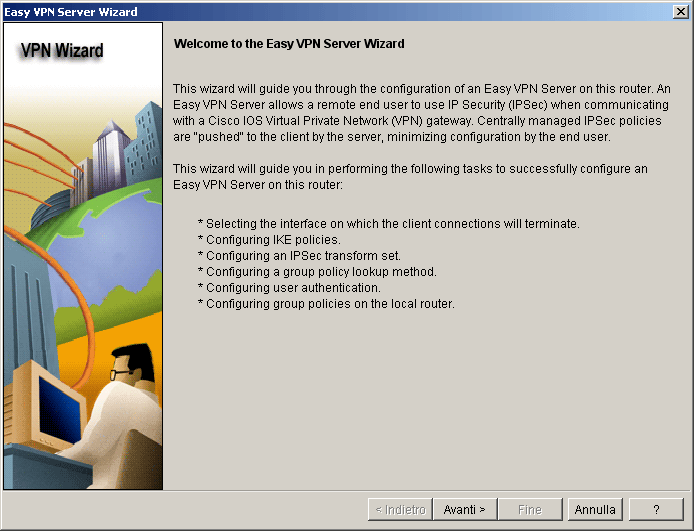 The group name is “test”, the password is “ciscozine” and the IP pool is from 192.168.10.1 to 192.168.10.10. Click on “OK” button to save the Add Group Policy. 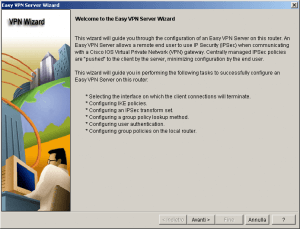 Once you have finished all the steps to configuring the Easy VPN Server, the Easy VPN Server wizard presents a summary of the configured parameters. Click Back to correct any errors in the configuration. 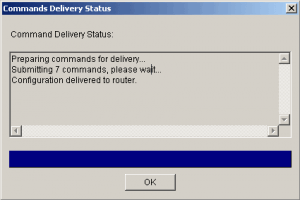 Otherwise, click Finish to apply the configuration to the router. 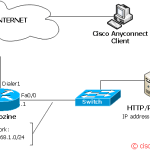 username ciscozine privilege 15 secret 5 $1$uZAG$n7SP/bF1Y2UEfepGjtblH. Remember to save the configuration!